CLEAN VEHICLE HISTORY/NO ACCIDENTS REPORTED, BLUETOOTH/HANDS FREE CELL PHONE, 2 SETS OF KEYS, REMAINDER OF FACTORY WARRANTY, and BACKUP CAMERA. AWD. When was the last time you smiled as you turned the ignition key? Feel it again with this wonderful xxxx Ford Escape. 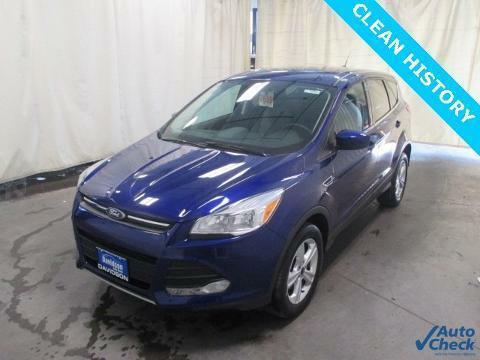 This SUV is nicely equipped with features such as 2 SETS OF KEYS, AWD, BACKUP CAMERA, BLUETOOTH/HANDS FREE CELL PHONE, CLEAN VEHICLE HISTORY/NO ACCIDENTS REPORTED, and REMAINDER OF FACTORY WARRANTY. Take this fantastic Escape down the road and fall in love with driving all over again.